ABC7 Chicago reports that Dentists and dental hygienists have begun speaking out against plastic microbeads in toothpastes after many have noticed the tiny blue beads lodged in patients’ gums or between their teeth. Dentists are concerned about the possible implications for gingivitis and periodontal disease, although no cases have yet been reported. In response, toothpaste manufacturers have indicated they are happy to remove the beads from their products, but there will be a “phasing out” period. We’ve reported before on the nonbiodegradable nature of microbeads. They are so fine that they slip through water filtration systems and from there they enter waterways, adding to the plastics pollution load and entering the food chain when aquatic animals and fish mistake them for food and ingest them. The Illinois state legislature recently declared a phased ban on the beads, and other states are debating similar legislation. It’s this lack of biodegradability that is causing concerns for dentists too. 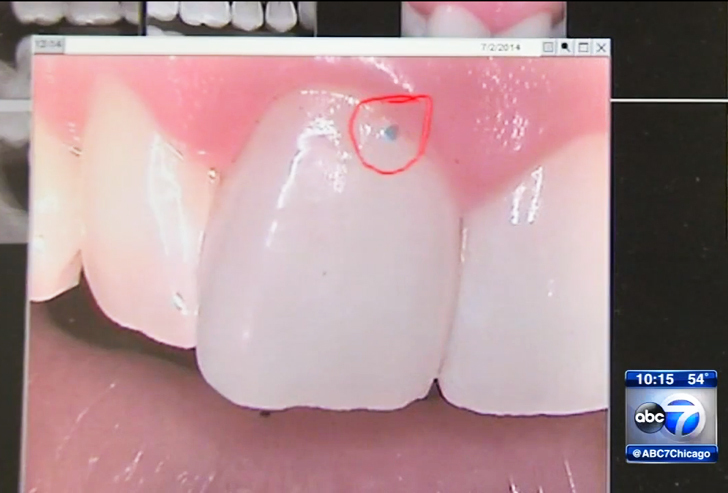 They are finding the tiny blue beads lodged up in patients’ gums, and as dentist Justin Phillips stated, they are concerned that “They’ll trap bacteria in the gums which leads to gingivitis, and over time that infection moves from the gum into the bone that holds your teeth, and that becomes periodontal disease.” The rub is that the microbeads aren’t actually in the toothpaste for their abrasive properties as they are in facial and body scrubs, they are purely aesthetic. The FDA also hasn’t specifically approved the use of polyethylene in toothpaste. Toothpaste is considered a pharmaceutical rather than a food, but the FDA has approved polyethylene as safe to come into contact with food, hence it is acceptable that it is included in toothpaste. Yet another reason not to swallow your toothpaste! In response to the concerns, toothpaste manufacturers have said they will remove the microbeads from their products, though timelines differ. Colgate states that none of its toothpastes currently contain microbeads. Proctor and Gamble says it will remove microbeads from many of its products within six months, with a complete phase out by March, 2016. Dental hygienist Trish Walraven has a list of Proctor and Gamble’s Crest toothpastes that contain microbeads on her blog here. To be sure, check the ingredients list on your toothpaste and avoid anything that lists polyethylene or polypropylene. There are also a number of natural toothpastes on the market, such as Tom’s, and you can make your own either from aloe vera or from coconut oil, baking soda and essential oils. Dentists and dental hygienists have begun speaking out against plastic microbeads in toothpastes after many have noticed the tiny blue beads lodged in patients’ gums or between their teeth. Dentists are concerned about the possible implications for gingivitis and periodontal disease, although no cases have yet been reported. In response, toothpaste manufacturers have indicated they are happy to remove the beads from their products, but there will be a “phasing out” period. In response to the concerns, toothpaste manufacturers have said they will remove the microbeads from their products, though timelines differ. Colgate states that none of its toothpastes currently contain microbeads. Proctor and Gamble says it will remove microbeads from many of its products within six months, with a complete phase out by March 2016. Dental hygienist Trish Walraven has a list of Proctor and Gamble’s Crest toothpastes that contain microbeads on her blog here. 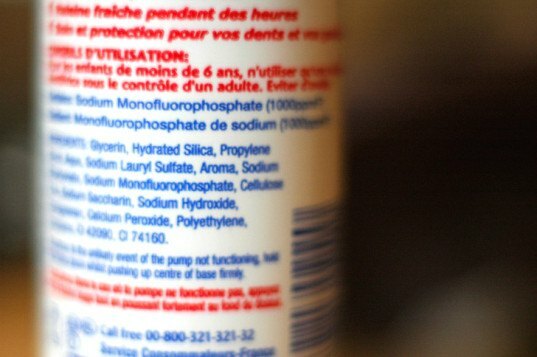 To be sure, check the ingredients list on your toothpaste and avoid anything that lists polyethylene or polypropylene. As we’ve reported before, the nonbiodegradable nature of microbeads. They are so fine that they slip through water filtration systems and from there they enter waterways, adding to the plastics pollution load and entering the food chain where aquatic animals and fish mistake them for food. The Illinois state legislature recently declared a phased ban on the beads, and other states are debating similar legislation.